We are established in Mumbai (Maharashtra) and recognized as one of the most prominent Manufacturers, Exporters and Suppliers of the U Bolts. We cater to the requirements of various industries and sectors by offering U Bolts that are manufactured as per the International Quality Standards; thus we are a reliable choice among the customers. We test the U Bolts on various pre-defined parameters. Heavy duty Type 316 SS U-bolts are designed with rolled threads for extra strength. Finished product is polished to provide a bright finish and increased corrosion resistance. Sizes 1/2” through 4” come with two nuts and will also fit PVC coated rigid conduit. Sizes 5” through 20” come with four nuts. 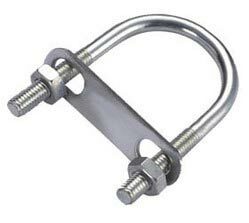 These U-bolts are manufactured in the thread sizes preferred for securing mechanical tubing and process piping. Available in pipe sizes 1/2" through 20" and supplied complete with hex nuts. Sizes 1/2" through 4" are supplied with 1 nut per leg. Mounting plates are also available to provide more secure attachment.